Did your dog eat some mushrooms and now you're not sure what to do? Or are you simply wondering whether mushrooms are something dogs can eat or not? Think no more - this article will provide you with some much-needed answers. Mushrooms are something many people like, but also something many hate. Whatever group you’re in, it’s still important to know whether dogs tolerate mushrooms or not, as they’re part of many of our meals, such as pizza for example. This is why it’s good to be informed and know if your dog can have some mushrooms occasionally or not. So, let’s get started! As you know, dogs love to eat! They’ll eat almost everything they come across, to the point that they can end up eating something they shouldn’t and that’s bad for them. Having in mind they’re not too choosy, it’s your responsibility as a dog owner to know what you can and can’t give your dog. Can I Give My Dog Mushrooms? Yes and no! Unfortunately, there’s no simple answer to this as it all depends on the type of mushroom and on your dog. Just like people, some dogs love them while others won’t come anywhere near them. Generally speaking thought – mushrooms are in most cases perfectly fine for dogs to eat. Don’t worry, we’ll dig a bit deeper than that! Let’s explore what makes mushrooms beneficial, but also what types of mushrooms are dangerous and should be avoided! So, let’s start with the good side and explain why mushrooms can be beneficial. Are Mushrooms Good For Dogs? Did you know that mushrooms aren’t vegetables? In fact, they fall down under the category of “fungi”! And as such they’re actually quite healthy. Mushrooms are a great source of niacin, riboflavin, copper, iron, potassium, phosphorus, selenium and essential minerals. The mushrooms that are sold in store contain vitamin D on top of all that, as they’re exposed to UV light during the harvesting process and as a result produce this vitamin. 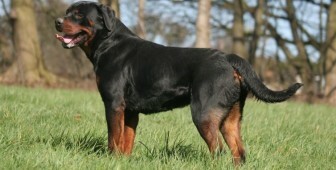 The iron will help dogs suffering from anemia, while the vitamin D contributes to a strong immune system. Another great thing about mushrooms is that they’re very low in calories and fat. They don’t contain sugar which makes them a great snack for diabetic or over-weight dogs. These are all great benefits, right? So if your dog likes and tolerates mushrooms you can relax knowing they’re really healthy. However, if your dog is allergic or has had too many there could be some problems. As mentioned, not all dogs tolerate or like mushrooms. Not to mention poisonous and wild mushrooms! Mushrooms in nature can be very difficult to identify and, in some cases, can turn out to be poisonous. This is why you should only consider giving store-bought mushrooms to your dog, and in moderation. 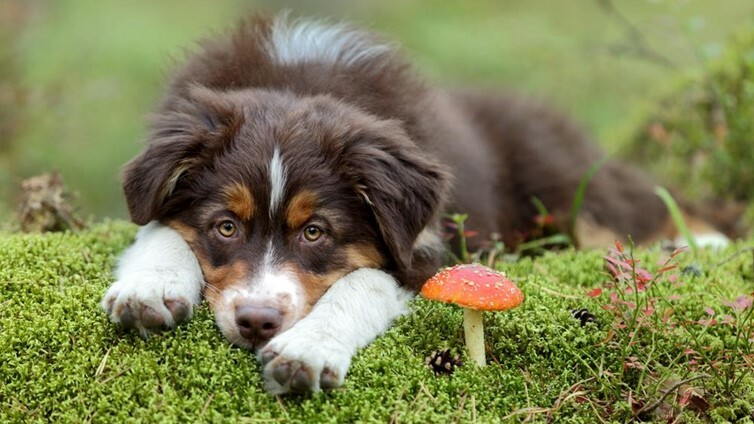 Mushrooms can become bad for dogs if your dog is allergic or if he’s had too many. If that’s the case it can result in bloating and gastrointestinal problems. Fortunately, that will pass after a certain time, In these situations, carrots are real life-savers as they regulate the bowel movement. This is the least serious symptom and the most common one. The gastrointestinal problems usually go away after a day. Besides the upset stomach, the pupils can become very small in this state. The heart rate might also slow down. This will most likely happen six hours after the dog has had a poisonous mushroom and requires vet care as soon as possible. In this condition the liver is affected, which is why the eyes become yellow. Seizures are also possible. These symptoms can occur even twenty hours after consumption and veterinary help is needed at once. It’s usually the Death Cap Mushroom that causes this. The only mushroom causing this is the Magic mushroom. If your dog has somehow stumbled upon this mushroom you will notice behavior changes soon after the consumption. The dog will be restless and imagining things or depressed. Coma is the worst possible scenario that could occur. Even if it doesn’t get that serious veterinary intervention is necessary immediately. This looks very scary, we know! However, there’s no need to avoid mushrooms all together as 99% are in fact not toxic at all. All of these situations can be avoided by simply not giving your dog anything else than store-bought mushrooms and not letting your dog eat wild mushrooms in the woods. What Do I Do If My Dog Ate Wild Mushrooms? If you suspect or know that your dog has eaten wild mushrooms you have to react as soon as possible. Don’t wait for the signs to appear as it could take up to 20 hours! Take you dog to the vet immediately, but try to keep your calm as much as it’s possible. It’s also important to bring with you a sample of the mushroom to the vet, if possible. Wrap it in a paper towel and put it in a paper bag before putting it in the fridge. This is important for later examination, as it’s important to know what caused the intoxication so proper diagnose and treatment can be established. Even though this is a scary situation, react fast but with as much calm as possible. Collect mushroom samples and go to the vet immediately. The sooner the treatment begins the better! All wild mushrooms are absolutely off-limits, including mushrooms growing in your own yard! Even though this may seem weird to you as you’re the one growing them you can never be careful enough as you never know, especially if different kinds of mushrooms are growing side by side. Wild mushrooms can cause organ damage and intoxication, as we’ve already mentioned. The most common poisonous mushrooms are Amanita Muscari, Amanita Phallaoides, Amanite Gemmata, Helella Lacunos and Galerina Marginata. If these names don’t mean that much to you it doesn’t matter as you should keep your dog away from ALL wild mushrooms! How Do I Serve Mushrooms To My Dog? We’re back to edible mushrooms now, having said that wild mushrooms should strictly be avoided. And edible mushrooms means mushrooms you buy in the stores! So, if your dog likes and tolerates mushrooms here’s how you can serve them. The most beneficial mushrooms are Maitake, Shiitake and Reishi – if you want your dog to enjoy the benefits as much as possible. But, no matter how healthy, one or two mushrooms are enough! No need to give more as it can only end up in gastrointestinal problems. They can be served both raw and cooked, but considering you’re usually sharing some when you’re cooking them for yourself it’s most common to give them cooked. If that’s the case it’s important that they’re not salted or with garlic or onion – they should be completely unscented. Cooked mushrooms are also a better alternative as compounds that lead to gastrointestinal irritation are then destroyed. Slicing it up in pieces will also make the digestion easier. As mentioned, mushrooms are great treats for dogs who like them, as they’re healthy and low in calories. However, you have to make sure your dog isn’t allergic first so start by giving very small pieces and see how he reacts. If diarrhea or stomach pain occur you shouldn’t be giving your dog mushrooms as he probably doesn’t tolerate them. Even though there’s not a simple answer like yes and no to this question, it’s still possible to draw a couple of conclusions. First, mushrooms are safe for dogs to eat IF your dog tolerates it and they’re bought in a store. All wild mushrooms should strictly be avoided, even those growing in your yard. Second, mushrooms are rich in vitamins and minerals and also very low in calories, so they make a great treat for dogs who like and tolerate them. However they should be given in moderation, as they can cause gastrointestinal problems otherwise. Third, intoxication from wild mushrooms is possible and can be quite dangerous. Symptoms of this are vomiting, diarrhea, lethargy, salivation etc. If you suspect that your dog has had wild mushrooms take him to the vet as soon as possible, don’t wait for the symptoms to start! To sum it up – some dogs like mushrooms, some don’t. If your dog does make sure you serve only store-bought and plain mushrooms, in moderation. And if your dog doesn’t – no big deal! There are plenty of other healthy treats you can give your dog. Can Dogs Eat Clementines and Tangerines? Are Mandarins Safe For Dogs?